A low-res version of the same map has been previewed and played on stream for weeks now, but this is our first look at the high-res version. It also differs from the release of the last new map, “High-rise,” in that only the high-res version is being included in the build, as opposed to the low-res version being released and tested beforehand. Lately I’ve been thinking a lot about the future of SpyParty, as both a game and as a community. I obviously want it to be successful: to stand on its own and make a real mark Chris Hecker can be proud of. A game that will be played for a long time. However, I’m increasingly worried about a few converging factors that I think could put our game in a bad position. On Steam, SpyParty would be available to potentially any one, and Steam access was our #1 request at PAX last year. I’m excited about the huge increase in players this may bring. Steam connects a lot of players, and having access to that will be instrumental to the growth of SpyParty, financially and communally. And although I am worried about the integrity of the community as much as anyone else, that’s not the source of my worry. As things are, the game is sorely lacking in several ways. Without a tutorial, a real way to practice on your own, a matchmaking system, a redesigned UI, and other issues that are too numerous to name specifically, it is scary to imagine people buying the game when it releases on Steam, and then just dropping it because it lacks several features many people consider basic. It is for this reason I want to focus on community based ways to alleviate this problem as best we can. Chris is working hard on the game, it’s his baby and he wants it to be great even more than I do, but if it does go on Steam this year I worry people will just pass it up. Thinking on this, having a command with such a wordy explanation is probably a bad idea. It has potentially driven people away due to its length and resulting intimidation factor, which is definitely not something to be proud of. However, explaining the game with any amount of brevity is not an easy task, and to compound onto that factor is the fact that it’s easier than ever to ignore in-game instructions and just hop into any given game at a moment’s notice. I worry about our ability to gain and retain new players as they learn about the game. 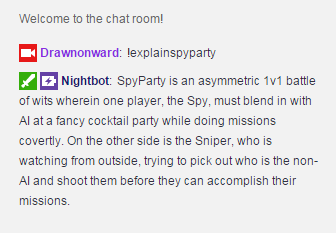 Whether it is someone who has played 200 games, or someone who sees the game on Twitch for the first time and decides to watch some tournament games being cast, I feel it is of the upmost importance to figure out how we, as a community, can teach and grow new players to ensure that SpyParty can compete with the big hitters out there. Games like CS:GO, League of Legends, and even StarCraft 2 are generally more grokkable than most SpyParty games, which can end instantly (and seemingly randomly, to someone not paying full attention to what’s going on). I’ve said recently that the most important resource to getting people interested in the game is our casters, as they are our first line of contact with many new players. 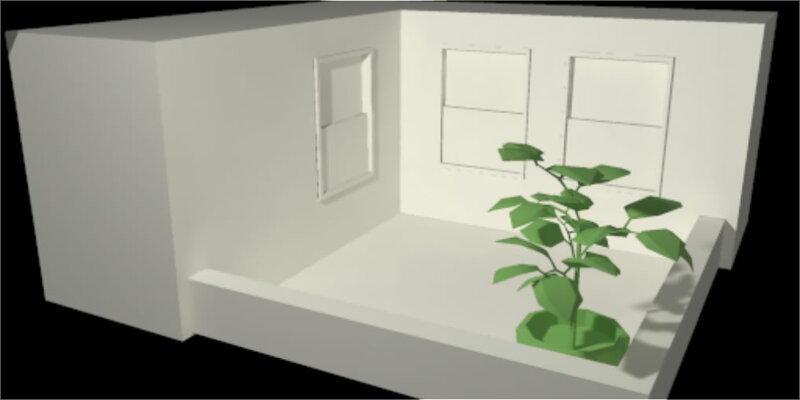 If they do a good job (read: showing people the game is deeper than some weird 3D Guess Who? variant), our chances of creating a new player go way up. I think we need more casters, to diversify, and to help prepare for a potential surge of interest in the game. We need more people casting, because Toboshi and WarningTrack can’t do it all on their own. Having competition, even just when it’s friendly, spurs people to improve, not to mention develop and discover new casting technology, and sharing that to make all casts better. It will also give viewers a choice on who to watch so they can develop favorites, and even watch as different casting styles evolve over time. Giving people a reason to care about the contestants in a tournament is a huge deal. Sports networks love to follow along as people go through dramatic comeback stories, or generally enjoy making their players seem human so we can relate to them. I believe that a similar lesson is to be had here, in the humanizing our players can give the average viewer a reason to care past the basic gameplay they might learn from tournament games. It can make rivalries come alive, and help people understand why it’s so shocking that Virifaux and KrazyCaley might both agree on some sniping principle. On the same train of thought as the above point, letting viewers into the head of these players is very helpful to let them know they are real people, with goals, who get excited and nervous like anyone else. This also allows for smack-talk, and discussion of strategies the player might use during the match, which can give the audience a real sense of excitement, as they will be expecting a specific play to happen. Lastly, in this format people can sense just how much this means to the players, and it gives it a level of seriousness that’s hard to find elsewhere. Every moment wasted, every second that is silent or not important to the tournament should be used to help people grasp what is going on in the games. In a game this deep, we need all the time we can get. This can go into a lot of different areas, but my first idea was cute animated clips of how the missions work, and maybe how each role wins or loses. Viewers love seeing large prizes being offered for gaming events. Seeing a player or team’s reaction to winning a new car, or an all-expense paid trip to somewhere exotic, is exciting, and let’s the audience get excited for that player or team, and potentially proud to support them. This makes people want to see the cast through to the end, which also gives us a sense of wrapping up, a feeling of closure if you will, and a feeling there will be a next time that people shouldn’t want to miss. This is kind of a tag-a-long on the Player Profiles and Interviews portion, in that people often pick a team or group to root for. It doesn’t always take much research, or any, but it gives them some familiarity with the community, and gives them a reason to watch these big events. I don’t know much, if anything, of real value about the CS:GO crowd, but I have a favorite team because I’ve watched a few large events, and I liked how they played or how their players acted during the tournament. The primary purpose of this part is to give any given viewer a sense of identity, something they can get excited about while they are super interested in the game, and something they can hold onto and come back if they decide to leave for a period of time. My reasoning for focusing on high level matches of SpyParty are for several reasons. They will be cast if they are for a serious event or tournament, which means it’ll be much easier for random people who stop by the stream to grasp what’s going on. With an event, you can work on things like production values, and make things look nice, not to mention setup interviews and profile overviews that can garner interest in the audience by talking about who these people are and why this matters to them. Tournaments get people interested with something on the line; reputation, prize money, large singular prizes – they all let the audience get excited when the winner is announced. Right now, SpyParty is hard to get into. The tools that makes games inviting aren’t implemented yet, and even our casters admit that the game doesn’t lend itself well it traditional casting methods because it isn’t “generally visually interesting… [or] easy to follow”. This puts us on a precarious path, with Steam access sometime this year, the new art remains unfinished, and the most recent update as of this writing will not (to my understanding) aid in any of these endeavors in a serious, tangible way. To put it bluntly, with the combination of little to no tools to help teach new players in a practical manner, and the possibility of a large influx of people, I feel like our best shot of keeping people interested lays in community-based efforts until we get features like tutorials fully implemented. Do you feel like I’m making a big deal out of nothing? Or perhaps that these solutions are misguided, and a different approach is needed? Please feel free to leave any feedback on this particular piece by commenting below, tossing me a line on Twitter, or by PMing me in the beta forums. Balcony is one of the most common maps to see at high levels of play. Some players love it, some hate it. I am not here to write about how much I like or dislike Balcony, but rather to discuss some core strategy regarding the map that I have been using a lot lately, and feel like other high-level players are using as well. I’ve begun to, after about five thousand games of Balcony (link accessible for SpyParty beta users only), form what I call The Average Game of Balcony. I say “form” because this is, at the moment, a theory. And before I continue, I want to note that this will not win you every game of Balcony; it’ll only work a certain amount of the time, and there are plenty of counters to it. But, on average, this should work more often than not. And when it works, it should work quite convincingly once you have the core ideas well formed and are ready to look out for them. It is also assumed that the game-mode is Any 2/3, with Purloin the Guest List and Fingerprint Ambassador turned off, as that is by far the most commonly played game-mode for Balcony. First lets get a few things out of the way: Many players don’t want to play a fancy game of SpyParty, they aren’t interested in getting a lowlight for their sweet pathing, they just want to win that specific game and move on to the next one. This theory preys on that mindset, and can be particularly brutal if they keep at it. Most players will switch it up if you keep winning on a given map, so this will not work 100% of the time, but if it does keep working I’d suggest you send them here. “Drawn,” you might be asking yourself, “that’s really obvious! How can that help anyone get better at sniping on Balcony?” Well the basic answer is that there are telltale signs of characters who only do these specific actions, and people who do not. Let’s start by looking at common actions of the Spies who play The Average Game of Balcony. I can’t tell you exactly how I would take advantage of any of this knowledge, as I want you to learn, adapt, and play however you want to. All I want to do is give a gentle nudge in what I believe to be the proper direction and see where it takes other players. Spies will ignore their turn to talk in Conversation Circles quite commonly, and they especially do not talk constantly unless they need to (which is basically never). They do need to talk, however, to flirt, and to Contact the Double Agent on a White Action Test, which averages to every 45 or so seconds. How you deal with this is entirely up to you, but in The Average Game of Balcony this is very easy for Spies to do, but there are definitely ways to punish more relaxed players who don’t bother with watching when they need to talk (although be careful for false-positives with no talks in the Conversation Circle). Spies tend to stay in the same spot for as long as they possibly can, rarely, if ever, moving. They also don’t like to attempt hard or interesting pathing choices, although this probably already nets most people reading this some Lowlights. Although there is no clear-cut way to watch for people not moving, there are ways to deal with those who consistently hang about in the Conversation Circle and never walk around the actual map. One example of this is to simply Lowlight people who briefcase during chaotic times, although do remember that players with adequate experience can emulate this, which then makes it an Un-Average Game of Balcony so the advice here becomes obsolete. Spies do not wait when they have the win in reach, with rare exception. Many fear their Seduction Target or Double Agent leaving the Conversation Circle so they do their Action Test as soon as possible. You can watch for flirts at certain timings (first 15 seconds, around 1:10-0:55 mark, and 0:20-0:00 respectively), especially if no real movement happens, and eventually catch the Spy flirting at the proper time. Characters who do not talk ~45 seconds after their previous one are unlikely to be our Spy, and if they are the Spy odds are that you are not playing The Average Game of Balcony. I would also like to remind our Sniper friends to use Overtime to their advantage when possible, because that can 100% confirm a shot or let the Spy lose due to Timeout, something a shot at 0:05 can’t do. I would say these are the defining characteristics of Spies that play The Average Game of Balcony. But I want to stress that I am not making fun of or belittling Spies who play this way. In fact, this whole theory works on the premise that most games of Balcony function in a very similar, almost mechanical, manner. So don’t feel bad if you win using The Average Game of Balcony while Spying: It’s a solid game plan, and because it’s a solid game plan it’s used often, which is why I can devise an entire theory (this one, that you’re currently reading!) to deal with it. Before moving onto the Spy side of things, I want to address the one mission I have barely touched on this entire article: Bug the Ambassador. Watching for Bugs is a huge deal on Balcony, and if you can’t guard Bug you may want to be careful using The Average Game of Balcony as a strategy guide, because when you lose to a Bug it feels pretty awful. My best advice on watching for Bugs is fairly simple, watch for the arm and the lean. You can find more info in this video. Onto how to counter Sniper’s using The Average Game of Balcony as a guideline for Sniping on the map: Throw curveballs at them. Make their Lights useless by acting useless, talk a ton, move around a lot, or attempt Bugs while they are trying to watch the party. It actually isn’t that hard, although watch out for Snipers who can watch for The Average Game of Balcony and the other, weirder games of Balcony all at once, as those Snipers are way scarier than anyone just using this as a guide. As a final note, I want to remind players that this is not the only way to look at Balcony. Don’t feel like you need to bother changing your playstyle if it has worked perfectly fine for you in the past. Do not forget that this is a rough guideline for what to look for and how to play against and with The Average Game of Balcony. I left a few things out of how I would do things with this information intentionally, hoping other players will learn the vital information and come to their own conclusions as opposed to copying and pasting a “How to Win at Balcony” strategy guide, if anything of the sort could even exist. That should be about all I need to cover for this particular topic, but if you feel I missed something, or maybe you disagree with the article, feel free to let me know via twitter, a PM in the forums, ask about it on my ask.fm, mention it while I am streaming, or in the comments section down below. Thanks for reading! Avoid hard tells. If the setup gives you the option to cut missions, cut as many hard tells as you can. Complete soft tells quickly. I do not guard soft tells especially closely, and while I can detect overactivity, it is not a strong suit. You can usually rush through flirts. Be careful when inspecting or fingerprinting, as these soft tells are relatively easy for me to track, especially on a smaller map with fewer partygoers. Double Agent and Flirt are the easiest missions to complete against me. Note that toing to statues with inspecting turned on is an automatic highlight. Use the time gained from completing soft tells quickly to set up a quality hard tell attempt. You can tell at a glance the people who don’t know what SpyParty is about. The ones who do eagerly rush to get in line to play, or else stand at a distance feverishly narrating the action to their friends. But then there are the ones who have never seen this before, or perhaps who have heard the name “SpyParty” vaguely associated with something cool, but have no other knowledge. My favorite part of working SpyParty’s PAX booth is talking to these people. I walk casually up to them with a slight grin on my face, feeling every bit like a lion stalking its unsuspecting prey on the savannah, or maybe a drug pusher with something extremely addictive to sell. I just need to get them to TASTE this game. My partner tells me that she thinks I am unrivaled as a persuader and/or salesman if I’m talking about something that I love or care about, and I love and care about SpyParty. “Hi, how’s it going, enjoying your PAX?” is how I typically start. Usually I get some kind of half-response, like “Yeah….” as they don’t look at me, their eyes straining to understand what is happening at the cocktail party they’re watching on the screen. Maybe this is some kind of sniper game, like Silent Scope, they are perhaps thinking. That’s when it’s important to intrude on their train of thought.